By Mary Ann Liebert, Inc.
A new review of studies involving nearly 3,000 children with attention deficit/hyperactivity disorder (ADHD) concludes that, although anxiety has been reported as a side-effect of stimulant medication, psychostimulant treatment for ADHD significantly reduces the risk of anxiety. Thus, patient reports of new-onset or worsening anxiety with the use of psychostimulants are not likely due to the medication and should not necessarily preclude stimulant use in ADHD, according to the authors of the study published in the Journal of Child and Adolescent Psychopharmacology, a peer-reviewed journal from Mary Ann Liebert, Inc., publishers. The article is available free on the Journal of Child and Adolescent Psychopharmacology website until Nov. 6, 2015. Catherine Coughlin, Michael Bloch, M.D., and coauthors from Yale University, New Haven, CT and University of Saõ Paulo School of Medicine, Brazil, emphasize the importance of managing anxiety in children with ADHD, as it can affect how they respond to treatment. In the article "Meta-Analysis: Reduced Risk of Anxiety with Psychostimulant Treatment in Children with Attention-Deficit/Hyperactivity Disorder", the researchers report a statistically significant reduction in the risk of anxiety associated with psychostimulants compared to placebo, and furthermore, higher doses of psychostimulants appear to be associated with a greater reduction in the risk of anxiety . "This new information on psychostimulants has the potential to change the way we treat kids with ADHD and improve the quality of their lives," says Harold S. Koplewicz, M.D., Editor-in-Chief of the Journal of Child and Adolescent Psychopharmacology and president of the Child Mind Institute in New York. Research reported in this publication was supported by the National Institutes of Health under Award Number 1K23MH091240 and the National Center for Research Resources under Award Number UL1RR024139. The content is solely the responsibility of the authors and does not necessarily represent the official views of the National Institutes of Health. 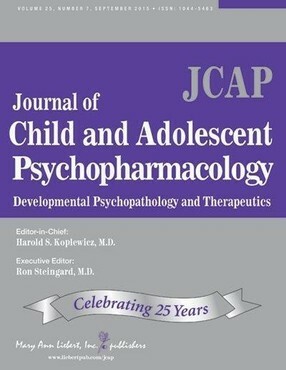 Journal of Child and Adolescent Psychopharmacology is an authoritative peer-reviewed journal published ten times per year online with Open Access options and in print. The Journal is dedicated to child and adolescent psychiatry and behavioral pediatrics, covering clinical and biological aspects of child and adolescent psychopharmacology and developmental neurobiology. 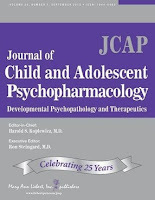 Complete tables of content and a sample issue may be viewed on the Journal of Child and Adolescent Psychopharmacology website. Mary Ann Liebert, Inc., publishers is a privately held, fully integrated media company known for establishing authoritative peer-reviewed journals in many promising areas of science and biomedical research, including Cyberpsychology, Behavior and Social Networking, Games for Health Journal, and Violence and Gender. Its biotechnology trade magazine, Genetic Engineering & Biotechnology News (GEN), was the first in its field and is today the industry's most widely read publication worldwide. A complete list of the firm's 80 journals, books, and newsmagazines is available on the Mary Ann Liebert, Inc., publishers website. Why Do Kids Have Tantrums and Meltdowns?